Madhushravani Tritiya, is observed in Mithilanchal region in North India – parts of Bihar, Uttar Pradesh and Madhya Pradesh. Madhushravani Tritiya 2019 date is August 3. Newly married women observe special rituals during the period for a happy life. In some regions the ritual is observed for 13 days and is known as Madhushravani Teej period. 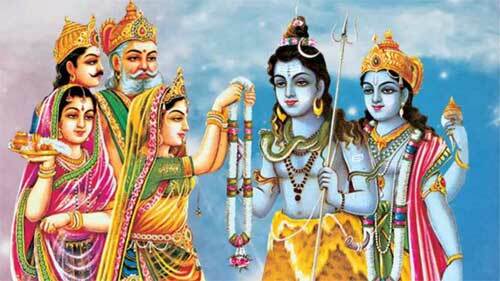 The main ritual is observed on the third day of the Shukla Paksha, or waxing phase of moon, in Shravan month as per traditional calendar followed in North India. In some regions the ritual begins on the Panchami day or the fifth day during the Krishna Paksha (waning phase of moon) of Shravan month (July 22, 2019) and continues for 13 days and the ritual ends on Madhushravani Tritiya day. Newly married women return to their parent’s home during the period and food is send daily during the period from her husband’s home. Married women who are observing their first Shravan month mainly participate in the ritual. Some married women visit and stay in their parent’s home during the fortnight. Gifts are given to the bride and groom during the period. In some region, the bride does not eat food containing salt for a fortnight. Pujas and rituals during the period are dedicated to Goddess Parvati (Gauri), Surya, Chandra, Navagrahas, Nag Devtas and Goddess Sashti. Poor people and married women are given food on the first day and the last day of the ritual. Today, the ritual is mostly observed only on the Madhushravani Tritiya day.